So I have been dying to tell all of you this, but for sake of anonymity of my company I’ll have to be vague. The theory that NBC is using its vast resources to mock me is seeming more and more like a real possibility. One of the people at my office has the same name as a character that was briefly part of the show The Office. First name, last name, the whole shebang. I spit out the soda I was drinking the day I discovered that. And then last week I found out we have someone new working for us with the same name (first and last) of one of the regular characters on the show. Are you freaking kidding me?!? We don’t have THAT many people who work here. Come on. Where are the cameras?! So I a while ago I decided because of how crazy Michael had been acting over the election that I would take Nov. 5 off from work. This way I could a) stay up late and watch results even if it took all night (because I’m a big dork) and b) wouldn’t be subjected to either Michael’s gloating or pouting the day after. 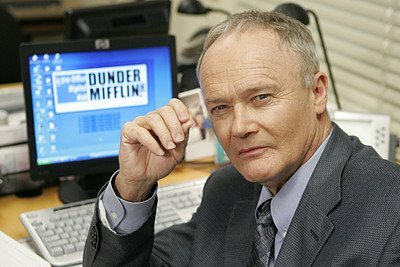 Apparently Michael was so bad, Creed called off work Thursday because he couldn’t put up with it. Creed cheers for the opposite political party as Michael, a fact which for the most part Creed keeps to himself. And while Creed doesn’t rub it in if his candidate wins, Michael most certainly does. I’m hearing most of this second-hand from Jim, but suffice it to say it must have been bad for Creed to call off work over it. When I came in Thursday, Michael wanted soooo badly for me to be his personal gossip girl. Everytime he started whining to me about Creed, I would deflect him with a work-related question until he finally went away. I have an official HR rep again!!! Hooray! And they will be at our office in a few weeks! Hmmm and this is going on at the SAME time The Office is going to be replacing Holly?! I told you I work at The Office! So what do you think is going to happen? Do you think Toby is coming back? Also, should I flood my poor new HR rep on their first day or ease them into all of these stories? Don’t forget to VOTE! Happy election day!